An ambitious plan to drive from one end of the Continent to the other with lots of stop-offs along the way. 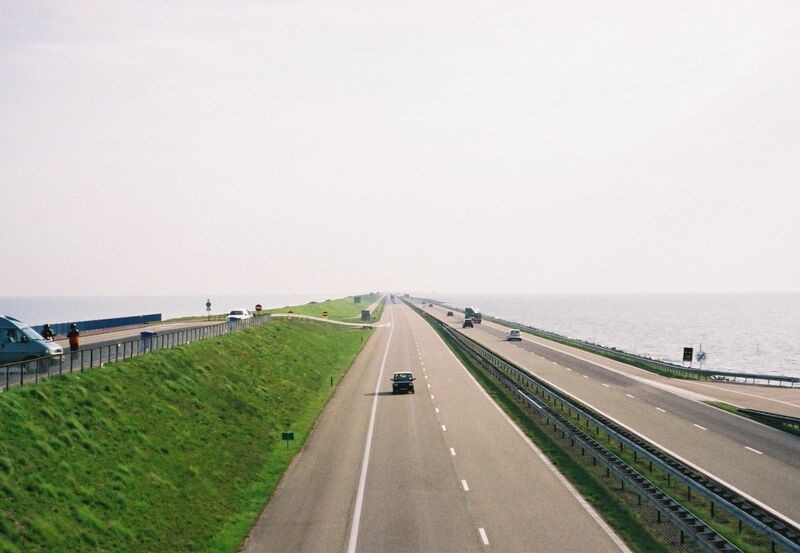 The A7 Afsluitdijk causeway motorway in the northern Netherlands, Den Oever to Zurich. A firm favourite. Photo @DriveEurope. Whatever happened to free-wheeling through Europe? Back in the old days we set off with a map, money – car – and a couple of weeks off to see where we ended up, usually following the sun. Oh well, we have managed to plan in some spontaneity too but the hard points are pretty firm, from one end of the Continent to the other. By happenstance we’re getting the P&O boat from Hull to Zeebrugge in Belgium on Monday for the remarkable price of £171, including ‘premier’ outside cabin. That’s quite cheap for an overnighter. From there it’s up the Dutch coast on the causeway N57. Because it’s part of the massive, concrete, sea-taming Delta Works it’s unlikely our expectations of a viewsome coastal road will be met. Nevertheless it’s described as one of the engineering wonders of the world by the American Society of Civil Engineers and we’re excited. From there we zip up to Amsterdam on the A4 then A7 north to Den Oever and our old-favourite Afsluitdijk causeway motorway (above) into the north Netherlands and Groningen. Regular readers will be all too aware of the massive holiday jams at the Emstunnel on the A31 near Leer, just over the German border. We want to know what all the fuss is about though it might not be so evident in the depths of autumn..
We toyed with staying on one of the Frisian Islands off the coast but ended up renting an isolated cottage albeit not far from Groningen itself. The idea is to chill out for a few days. After that hopefully we’ll be in the mood for some serious trans-Continental motoring as we finally put faces to names and check out the border situation on the ground in Gibraltar. The complication is that rather than the direct route – almost exactly 1,600 miles – we want to drive the A45 ‘Queen of the Autobahns’ Dortmund-Frankfurt, make full use of our Swiss vignette and, rather than reacquaint ourselves with the summer-slog A7 Rhone Valley Lyon-Avignon, dodge west to Clermont and down the A75 to the Millau Viaduct. How long this will take is anybody’s guess. We leave Groningen on Friday morning. Hopefully by Sunday evening we’ll be supping bears in the shadow of The Rock having taken in A-395 Veleta, Europe’s highest paved road, and the famous Ronda road too. After Gibraltar plans are definitely woolly. Ideally we drive up to Spain’s northwest coast via Lisbon, just because, then catch the Brittany Ferries boat from Santander home on Thursday night… but honestly it all sounds preposterously ambitious, even to us.